There are 13 Assisted Living Facilities in the Saint George area, with 11 in Saint George and 2 nearby. The average cost of assisted living in Saint George is $3,298 per month. This is lower than the national median of $3,346. To help you with your search, browse the 62 reviews below for assisted living facilities in Saint George. On average, consumers rate assisted living in Saint George 4.5 out of 5 stars. Caring.com has helped 14 families in Saint George find high-quality senior care. To speak with one of our Family Advisors about assisted living options and costs in Saint George, call (855) 863-8283. St. George is a town in southern Utah nestled among many national and state parks, including Zion National Park and Snow Canyon State Park. St. George is approximately 118 miles northeast of Las Vegas and is known for its scenic red cliffs and desert habitat. Seniors in the St. George area can enjoy multiple golf courses and walking trails and is therefore a viable option for those who love the outdoors. 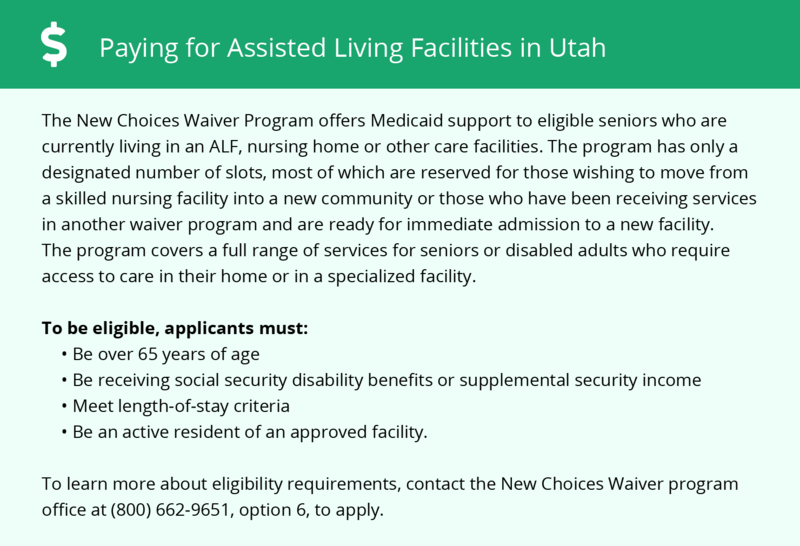 The Utah Department of Health provides licenses and certification to assisted living facilities (ALFs) in the state. There are two types of ALFs in Utah, one that offers daily assistance to two or more residents, and one that provides 24-hour assistance to those who are mentally or physically impaired. There are 11 ALFs in the greater St. George area. St. George has an array of community resources for seniors, including the St. George Senior Center, an organization that provides more than 100 different activities each month, including computer classes, volunteer service and arts and crafts. The St. George area is home to world-class medical facilities, including Dixie Regional Medical Center, in the event of medical emergencies or illness. For seniors who are looking to travel to either Salt Lake City or Las Vegas, Greyhound Bus Services offers discounted fares for citizens aged 62 and older. Within the city, the Suntran public transit system provides half-off fares for seniors. The climate in St. George is warm, with temperatures typically ranging between 40 and 90 degrees. Seniors who dislike the rain could consider St. George because it only receives 8 inches of rain annually, compared to the national average of 39 inches per year. The crime rate in St. George is around 38 percent lower than the state average and is approximately 30 percent lower than the average crime rate across the nation. Seniors who are concerned about violent crime or property theft but want to live in Utah should consider the low crime rates in the St. George area. The overall cost of living in St. George is around 5 percent cheaper than living in Salt Lake City, the state's capital. Seniors can expect to find cheaper health care costs and more expensive grocery costs in the area. Assisted Living costs in Saint George start around $3,298 per month on average, while the nationwide average cost of assisted living is $4,000 per month, according to the latest figures from Genworth’s Cost of Care Survey. It’s important to note that assisted living rates in Saint George and the surrounding suburbs can vary widely based on factors such as location, the level of care needed, apartment size and the types of amenities offered at each community. 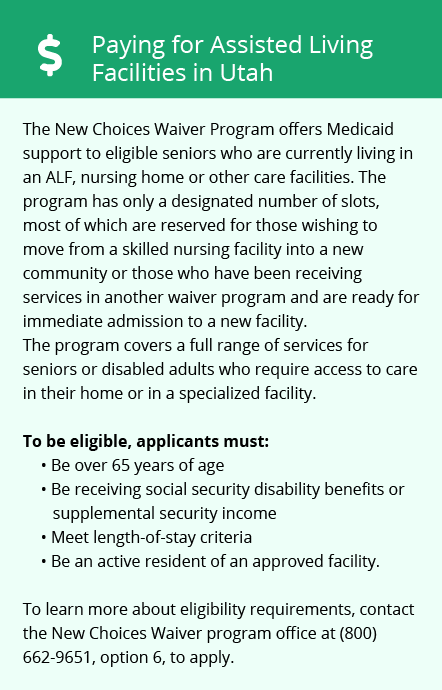 In St. George, the state of Utah pays for residential services in ALFs under the Medicaid New Choices 1915(c) Waiver program for qualifying seniors. To see a list of free assisted living resources in Saint George, please visit our Assisted Living in Utah page. Saint George-area assisted living communities must adhere to the comprehensive set of state laws and regulations that all assisted living communities in Utah are required to follow. Visit our Assisted Living in Utah page for more information about these laws.